Though the Delaware, Kickapoo, and Osage Indians had rights to the area, settlers began to filter into what would become Greene County long before Missouri became a state in 1821. 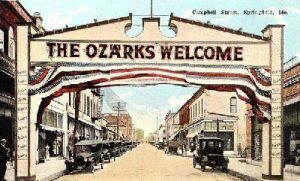 In 1830, the U.S. Government forced the removal of the Indians to a reservation in Kansas and Greene County was opened for settlement, bringing in more pioneers to the new state of Missouri. The county was officially established on January 2, 1833 and named for Revolutionary War hero, Nathaniel Greene. In no time at all, small settlements began to pop up all over the county, such as Brookline, Ash Grove, Republic, Willard, and Springfield. Springfield, founded by a man named John Polk Campbell, was by far the largest. Arriving from Tennessee in 1829, Campbell found a natural well of water flowing into a small stream at the foot of a wooded hill. Wasting no time, he carved his initials into a tree, establishing his claim. Returning to Tennessee for his family, he returned in March, 1830. The business district started with Junius Cambell’s store at what would become Olive Street and Jefferson Avenue in 1831. Before long, other settlers began to arrive and the area became a sizable log cabin settlement with several stores, mills, a school, a post office and other businesses. In 1835, the town site was platted when John Campbell deeded 50 acres of land for the county seat. Just two years later, a two story brick structure was completed in the middle of the public square, serving as Springfield’s courthouse. In 1838, the town was officially incorporated. In 1858, Springfield became a stop on the Butterfield Overland Mail stage coach line which ran from Tipton, Missouri all the way to San Francisco, California. This brought even more people to the area. By this time the town supported some 1,200 residents and boasted 3 hotels, 2 newspapers, 3 churches, 5 schools, a bank, and a number of retail businesses. However, just a few years later the prosperous city would be torn apart by the Civil War. Missouri was a bitterly divided state between Northern and Southern sympathizers and the first battle of the area, The Battle of Wilson’s Creek, occurred some 12 miles southwest of Springfield on August 10, 1861. This battle was the first major Civil War engagement west of the Mississippi River, involving about 5,400 Union troops and 12,000 Confederate soldiers. 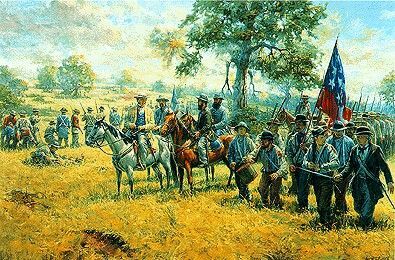 The skirmish was also one of the bloodiest of the war with over 1317 Union and 1230 Confederate casualties. Although a Confederate victory, the Southerners failed to capitalize on their success. Just two years later, on January 7-8, 1863, the city itself would become the scene of a Civil War conflict, in what would become known as The Battle of Springfield. In an attack by Confederate General John Marmaduke, the confederates attempted to capture the city of Springfield and its military stores. Though more than 100 men lost their lives, the attack was repulsed and Springfield was spared from capture by the Confederate forces. Though many people left Springfield during this time of turbulence, many more returned after the war was over and began to rebuild the city. Though Springfield has never been thought of as one of the many notorious Wild West towns, it does have one gunfighter legend. On July 21, 1865, famous gunfighter, James “Wild Bill” Hickok killed an Arkansas man by the name of Dave Tutt. Dueling in the streets, the dispute was prompted the night before when Tutt had won Hickok’s pocket watch in a poker game. Though Wild Bill was arrested, he was later acquitted of the murder. 1870 saw the arrival of the St. Louis-San Francisco Railway which created a further economic boost for the burgeoning city. 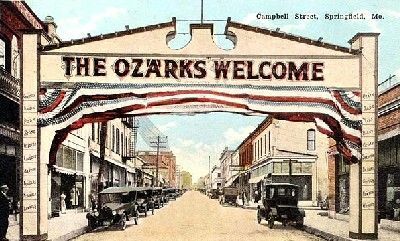 By 1878, over 150 business houses were operating in Springfield and the town had become so popular it became known as the Queen City of the Ozarks. In 1880, a woolen mill was producing 1500 yards of cloth daily, cotton mills were converting 1,000 bales of cotton into fabrics on an annual basis, and mills were grinding 200 barrels of flour per day. In 1887, Springfield was one of the first cities in the nation to get an electric trolley. The system quickly spread with lines going to many different parts of town and riding the streetcar soon became not only a convenience, but a form of entertainment. The last streetcar ran in 1937. By the turn of the century, Springfield had about 23,000 residents. By 1923, there were 148 miles of street in the city, 60 of which were paved. So, when John T. Woodruff, of Springfield, along with Cyrus Avery of Tulsa, Oklahoma began to suggest a transcontinental highway, Springfield was a logical choice along the path of what would soon become Route 66. Both Woodruff and Avery worked tirelessly for a highway that would carry America’s new “Mobility Nobility” from Chicago, Illinois all the way to Los Angeles, California. Persistence prevailed and Route 66 finally became a reality in 1926. Springfield became an important transportation hub, which further aided its population and economic growth. John Thomas Woodruff, was not only the Missouri partner promoting Route 66, but an infallible businessman and promoter of all types of transportation throughout Missouri. 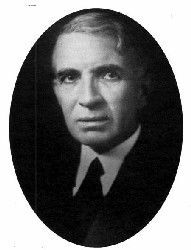 An attorney for the Frisco Railroad in Springfield, he was largely responsible for the development of other businesses in the burgeoning city, as well as the hospital, fairgrounds, and golf course. He also influenced the developments of Powersite, Norfork, and Bagnell Dams. The Kentwood Hotel built in 1926 by John T.
Woodruff is now a dormitory for MSU. Ever the builder he also constructed the Woodruff business building which still stands today, as well as the Sansone, Colonial, and Kentwood Arms hotels. Only the Kentwood Arms, built in 1926, remains. 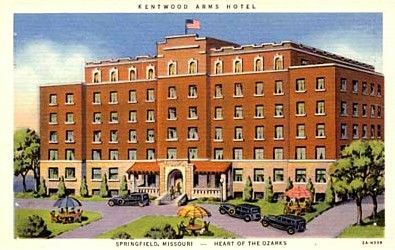 Today the building is owned by Southwest Missouri State University and used as a dormitory called Kentwood Hall. When the Mother Road came through, all manner of motor courts, gas stations, diners and cafes were built to service the many travelers. Billboards and neon once dotted the landscape. By 1940, the population of the city had reached over 60,000. Spurred by rapid industrial growth over the next twenty years, Springfield’s population increased dramatically, resulting in a population of 100,000 by 1960.